I am pleasantly awake as rain falls in the Megalong Valley, the romantic sound of water on an iron roof almost drowning out Tom's far less than romantic snoring. I wonder what deep human responses are activated by the sound of rain. It's probably regional. In Welsh valleys it would be more like ... Gareth ... it's raining ... better drag the goats out of the bog .. but in drought stricken Australia, unless swimming in floods, rain is God, the future, life itself. It is nature's prerogative than belies the fashionable conceit that all choices lie with us. The water that is falling here, as beautiful as it sounds, is a dollar down payment on the national debt. The Megalong, like much of New South Wales and Queensland, is in dire drought. But It's a drought that dares not speak its name, well not with the imminent release of the INXS mini-drama anyway. My friend Ben is a farmer's son from Narromine. We spoke recently and his reaction to my year long tour was a farmer's one, that I would witness terrible tragedy and despair out bush. He told me a story that you might have all heard. I hadn't and I can't shift it from my mind. It ranks with other stories I have heard over the past year. Like Pete from Strathalbyn in the Adelaide Hills who runs a support group for farmers and who fields frantic calls from women at midnight to say their husband has a gun to his head. Or Broady from Booborowie who explained that if he got one cent for the wheat that creates a loaf of bread he would make a living, but he doesn't. Ben's story has a resonance that should sound across the country. A Queensland farmer took his 400 cattle to the trail head to be transported to market. They were in such poor condition the driver refused to take them because too many would die on the way. The farmer shot the cattle and then himself. The tragedy enacted in some lonely place speaks of the pain of losing farms that have been in families for generations, of depression, of battling drought and globalization and the unkindest of all beasts, the market. It shouts of the final straw. There is also an act of compassion embedded in it, that he shot the beasts before himself lest they have to endure the slow death that besets much of rural Australia. The rain is still falling here but the subsoil will be as dry as powder. So too will the problems that lie under whatever drought relief is dispensed by government to farmers. 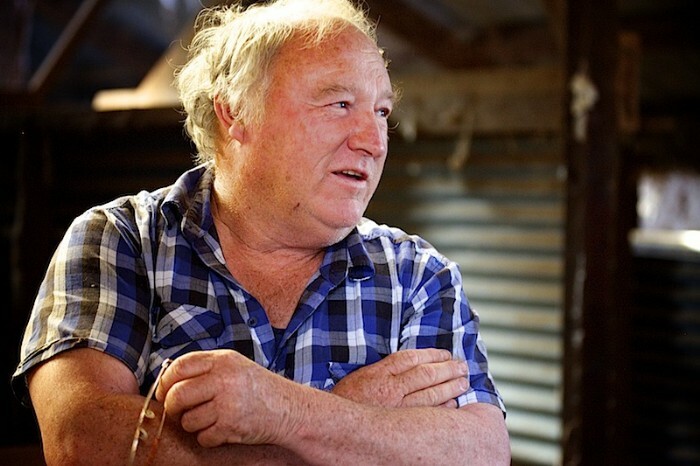 At the core of much of rural people's conversation is a red hot anger masking unrestrained grief that Australia is losing its food bowl, and that food is seen as just another commodity subject to the same market forces as digital phones or disposable nappies. They know it is much more. Last year I met a farmer from South Africa who fell in love with an Alice Springs girl and now manages a massive property in Central Australia. He said .. I am a Boer and that means farmer ... It wasn't an occupation but a calling to produce food. I will try my best to listen and report stories from the heartland of Australia over the coming year. For the moment though, I am enjoying the good rains falling here in the Megalong Valley, especially so as Tommie has drifted off into a rain-induced and thankfully silent dream. Love your writing Raymond! These stories need to be told and I can see already that it will be compelling. Hi Helen. Thank you very much. Love to catch up you when I get up north. Yes .. I wonder to what extent a country can be defined by its food .. not its Gross National Product. May the rain continue to fall and bring some peace to a drought-ridden land. Safe travels, Raymond and Tommie, and bring back the stories that need to be heard. Now that would be a mission Lori. To bring back stories that need to be heard. I am watching and reading, thank you for your keen point of view, I do want to know what is happening out there in our land, give Tommie a pat from me. Hi Ingrid .. A lot of the ferns and green plants in the Blue Mountains are sustained by hanging swamps. They are like soaks that release the water slowly during dry months so it can be quite green even in drought. You bicycle ride sounds exciting. Very interesting system. It's a sunny day again and a new bike for me. Hi Raymond I will be following you and Tommy until August when we will be heading to Europe for our 3 month adventure. Great to see earlier comments from people I have met on your walks. Hi Sally … Maybe we can follow you as well. Hi Raymond, i love the way you use words - so evocative. This subject seems a bit ironic to me though, as a Brit living in France we've been watching, since Christmas, the terrible flooding in the south of England where the people are also very angry at the lack of understanding in the government of what the area needs. Oh - Gareth in Wales would need to get the sheep in, rather than goats!lol. Much love to you and the beautiful Tommie - looking forward to reading more about your trip. Thank you Jacqueline. It is actually good to be writing again. I hope to post weekly from the road. Surely there would be at least one goat for Gareth to free. Hi Raymond, we curse rain here in the North of Germany, but two summers ago we had a kind of draft, too and it immediatly showed in the price of bread and veggies. I live in a village withh farmers and I know how right you are from them. Nobody has shot himself here so far, bur most can´t make a living out of farming aone anylonger and have to take up a dayjob in a factory or some such. It´s a shame. Thank for your wordsd and I´m praying for more rain in even measures so no flooding occurs caus of the dry soil. Hello to the you in the north og Germany. It seems to be an international phenomena that farmers are struggling. Here in Ireland we get a little too much rain, I wish we could share, but I know exactly what you mean by loving the sound of it on a tin roof. I have visited Australia 5 times in all to date, I fell in love with your country the first time I was there, harsh to extremes that it is, it is a wonderful place with amazing people. So many 'Townies' wonder why the farmers put up with such a hard life to the point where they have nothing left, how can anyone make these townies understand they did not choose this life--the life chose them. It is in their blood.They are fantastic people. A breed apart! I have been eagerly awaiting the start of your journey and will follow with interest. Thanks for highlighting the plight of our farmers they need all of our support. That is extremely nice to know Fran. I think I am starting to get into the swing of it nowalthough it has been quite a setup. Hey Julia. Yes,I find it easier to write when I am on the road. Things just have to escape out of my head onto the page. The sound of rain for you would sound like salvation at the moment I guess, like with farmers out west. Truly, everywhere I go it rains so I might have to get down there if it doesn't break. We would hail you as the God like figure that you are. Yes .. he cometh .. the Swagman cometh ..in his chariot of water. Maaaate. I am totally in awe of your command over the elements, as you were writing your last reply rain started falling and I am listening to it falling on the roof as I write this. I don't know how you manage it but now you can create rain merely by thinking about it. What a guy! The priorities are certainly schewed. That Willie Nelson song "On the road again" keeps running thru my mind every time I see your posts Raymond, Love reading the updates! All jokes aside, I do bring the rain. The first 3 times I went to Broken Hill it poured rain. Now the Megalong. Ill do my best as I head your way Linda. Hi Raymond, Farmers markets are everywhere now and are derided as the desires of urban rendies. we have one in Moruya that is now one year old, and it's making a difference. If farmers send their produce to the Sydney markets they may recieve 8% of the retail price. At a farmers market they get 94%. So to get the same return they need to grow 10 times as much. It is making a difference to lots of existing farmers and some new start ups. We have to invent new models for our farmers. they are being totally screwed by 'economics'. Yes Stuart. I know Ben's family who I mention in this article take there saltbush merino meat to farmers markets, and have done for years. They travel all over the state I think. I agree. There has to be a reinvention of marketing models. Hi Christine. Tommie and I did our little talk last weekend. It was great. Lovely stories and a gorgeous night. I hope to do another in our next destination, Coolah.